Known South African National Defence force (SANDF) projects, past, present and future, presented alphabetically per Service/Division. The information below was compiled from Department of Defence Annual Reports and from written answers to questions asked in Parliament. In production. PAP April 27, 2006. OT&E Sep 2007. Partial acquisition. Commissioning set for 2009. Partial acquisition only. Production phase. PAP August 2004, Delivery November 2007. Project study phase. Foreseen date for production: 2008. Eight heliborne systems, eight vehicle systems with 31 275 anti-personnel and 19 500 antitank mines. Similar to Dart (below), but using Israeli technology. Project study, SR to AACB, August 10, 2006. Battlefield surveillance radar, thermal imagers, UAV. PAP April 21, 2004. Partial acquisition. PAP approved April 21, 2004. Was to be completed by March 2007. 12 Light Multiple Launchers (LML), 120 missiles. To be complete by December 2009. Denel is prime contractor. High profile contract. 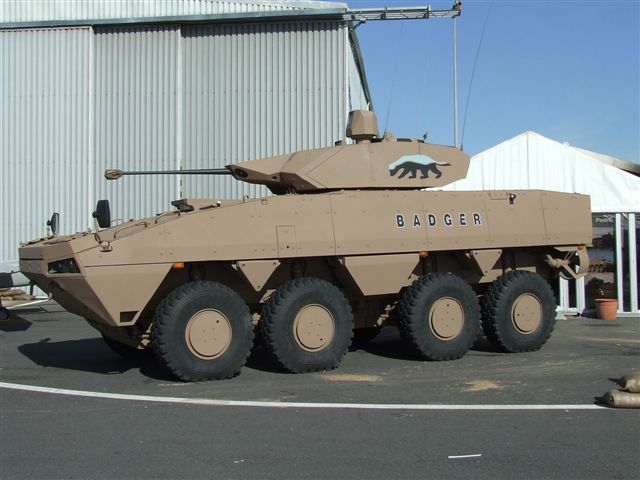 “Badger” ICV to replace Ratel. Extended project study. PSR (2) October 2005, PSR (3) August 2006. Contract awarded May 2007. R8.4bn for 264 vehicles. Five variants. 30/40 to be built by Patria. Contractors: EADS, Patria, Fulcrum, Denel, LMT, more. Entered concept phase, September 2005. Contract awarded to MBDA/Fulcrum December 2006. First units delivered early 2008. R296.7m for 43 launcher upgrades and missiles. 210 recovery vehicles, 95 repair vehicles. Requirement for 282 MBT. 1 TTD built. Development and partial acquisition of Advanced Multi-Role Light Artillery Gun Capability (AMLAGC). SR, September 28, 2005. PSR and spec was due by February 28, 2007. Foreseen commissioning: 2012. SR approved, February 13, 2006. PSR (1) February 2007. PAP November 10, 2004. Commissioning. SR, February 13, 2006. PSR, January 2007. Concept phase. SR & functional study. R200K required from SCAMP. Presented to AASB, July 20, 2006. One prototype built, apparently without authorisation. PAP, March 2008. Acquisition study in progress. Commissioning. Completion scheduled for March 2008. TOW Mapats clone with Israeli input. Upgrade of Oerlikon 35mm towed air defence guns. Project study underway, SR, August 10, 2005. PSR March 2007. No funds available at May 2007. Acquisition study. SR, October 18, 2005. PSR approved September 5, 2005. AP March 2007. Foreseen commissioning: 2008. Staff target in process of approval. Project study. SR, April 21, 2006. PSR, February 2007. Foreseen commencement of commissioning 2008. Functional study, ST, February 5, 2005. Functional study and SR, February 2007. Operational supply support system (Cargo and fuel handling). Approved PSR December 8, 2005. Awaiting final decision to commence contracting. Commissioning. Preliminary completion March 2007. Project not funded for future phases. Smart load-bearing equipment and uniform. Acquisition study for low risk items. Development plan for complex sub-systems. Similar o the US Army`s Land Warrior, etc. Transport by truck, train and ship. Identified need. No registered project. Upgrade of the C47 aircraft fleet to C47-TP standard. All aircraft have been upgraded and the project was completed in FY 2006/07. Self-protection system for the Oryx. Development of a short-range air-to-air missile. Development phase has been contracted as a joint venture with Brazil. Phase 1 to upgrade existing fire tenders was completed in 2006. Phase 2 for the acquisition of fire tenders is in its project study phase with completion date of 2010. Development of a reconnaissance Cheetah based on the Mirage IIIR2Z. Not adopted. Aircraft used to test “advanced combat wing” developed under Project Carver. Upgrade of 11 Mirage IIID2Z, 3 DZ and 16 EZ to Cheetah D2, D and E.
Advanced new technology fighter project. Also EW and refuelling platform, possible AEW. Acquisition of five Cheetah Bs from Israel (Nesher T). Programme completed 2004, weapon deployed on Cheetah. Phased out 2008. Final acceptance of the system at 80 Air Navigation School. Operational Test and Evaluation scheduled to end late August 2008. First two phases in progress. Rooivalk: Deployment baseline by May 2008, Dev. to be completed by 2009. Mokopa: R70m set aside to acquire missiles. R120m spent on development to FY2007, R4.6m to be spent in FY2007/8 and Denel to spend a furtherR98.25. Still under consideration by SAAF not yet registered as a Required Operational Capability (ROC). Acquisition of the B737 is completed and the aircraft is in operation at 21 Squadron. Upgrade of the two aircraft is competed and the aircraft is in operation at 21 Squadron. Superseded by Gripen ALFA acquisition. Cheetah fitted with a strengthened undercarriage and clear vision windscreens. Day/night reconnaissance system for the C208. Acquisition of three sets of mission equipment and the modification of 11 aircraft have been contracted. Operational test and evaluation scheduled 2008. Release to service planned for late 2008. Six new radar sets, one mobile set upgraded. R34.924 million. Acquisition of four maritime helicopters. Replacement of the radio-switching network. Project in study phase, 2006. Glass cockpit demonstrator using a Mirage F1. ATE and others. Precursor to indigenous Hawk navigation and weapons system (Project Ukhozi). Upgrading of six AR3D radars. Rebuild of a crashed Cheetah D2 with an Atar 09K-50 engine. Ex Israeli Kfir airframes incorporating advanced avionics and EW. Completed. 35 aircraft to be upgraded, R400 million budgeted. 12 aircraft @R2-3m each, R24-36m for the fleet. Acquisition of Type 351 Minesweepers. Project in definition phase in 2006. Technology research, local future Naval Combat System Architecture and related computer network. Domestic design, 1990; Spanish design 1995. Acquisition of Mine Counter-measure equipment. Project in definition phase. Scheduled for completion by 2010. Integrated ship support concept and agency. Acquisition of mine countermeasure processing suites. Cancelled due to a change in SAN mine warfare policy. All four delivered, fifth order possible. Acquisition of an underwater signature measurement system. Project in acquisition phase. Phase 1 (the signal measurement system) is scheduled for delivery December 2007. Phase 2 (magnetic treatment centre) is scheduled for completion December 2009. Cancelled in favour of Thales TAVITAC. Thwarted by arms embargo, mid 1970s. Acquisition of two multi-purpose harbour tenders. Acquisition of six general workboats. Anti-multipath enhancement for the Valour-class frigates` Optronic Radar Tracker (ORT). Pre-production testing will commence in 2009, leading to a roll-out on all ORTs in 2010. Close-In Surveillance System (CISS) to defend against asymmetric threats to ships. ECM trials commenced in 2005 and an Advanced Concept Technology Demonstrator should be ready in 2010. Sonar development for underwater security. Defence aeromedical and specialist training facility. R400 million, not budgeted for. Development and partial acquisition of a basic chemical and biological self-protection capability consisting of CB detection, protection and equipment de-contamination. 6 urban defence systems, 3 conventional, R422 million reqd, R198m on budget for next 13 years. Staff Requirement due April 2007. Tactical EW capability for the SANDF. Staff target approved Nov 2006. Functional study due mid-2007. SAAF new generation VHF/UHF radio. ACR500 (fitted to Rooivalk, Hawk, Gripen, A109, SuperLynx. Landward EW system for 2 Signal Regt. SAAF integrated airspace control system, 1983-1995. C2, radar, remotely-operated HF, VHF, UHF radio for low-level in-flight C2. Control & Air Defence System). Functional study complete. Acquisition Plan due July 2007. Project Study Report due July 2007. Strategic management system to underpin performance management. “First order business solution set for implementation, FY2007/8, fully fledged system to be implemented Jan 2009. Regulate organisational structure process within DOD. Strategic planning tool and information system. Professional strategic planning capability for the DoD. FARDC cooperation in the DRC. concepts and related systems architectures”. Long-range high-speed boats for the Special Forces. Creation of Peace Mission Training Centre at the SANWC. US, UK, Canadian donor money, SANDF contributed R3 million. Pre-audit of territorial reserve units and HQs closed i.t.o. Project Mounting. Richard Young, by email, October 15, 2007. Three phases proposed, total budget estimated R3.5bn in 2000. DoD written reply to a Parliamentary question, May 11, 2007. Dave Becker, Cheetah Farewell, SA Flyer, May 2008, p40. Written reply to question 1046 in the National Assembly, June 26, 2007. From the DoD Annual Report, 2005/6. The figure conflicts with that given in a written answer to a question in Parliament, reproduced in the previous column. (Internal question paper 13-2007, Question 624, May 11, 007. Richard Young, per email, November 13, 2007.